Use mail order gardening catalogs to plan your next garden. Mail order gardening catalogs are a good resource to find the latest gadgets, plant varieties and ideas for your garden. Garden catalogs have evolved from primarily selling seeds to a resource that many gardeners enjoy receiving in the mail each season. There are many reasons to order plants from garden catalogs, from a greater variety to choose from to ease of ordering. The following are just a few of the reasons many gardeners turn to catalogs for their garden and landscaping needs each year. While almost everyone has access to a nursery or garden center locally, there may not be much variety in the plants that are offered. For this reason, gardeners who want to expand their gardens to include unusual plants may turn to ordering them from a nursery outside of their locale. For example, someone who wanted to plant blueberries might find two or three varieties locally, while a mail order catalog may have up to 20 varieties available. Another reason gardeners may choose to order from a garden catalog is that it saves time. Instead of fighting traffic and mobs of people at a garden center, people can choose exactly what they want from the comfort of their couch. Orders for many nurseries may be completed online, phoned in or simply dropped in the mailbox. Plants will be mailed from the nursery at the correct time for planting, depending upon growing zone. Other items, such as seeds or spades, will usually be mailed right away. Gardening catalogs have evolved from small booklets selling seeds to slick catalogs that sell everything a gardener may ever want or need. Many of these catalogs also include gardening tips and articles to help gardeners with their planning and planting each year. In addition, product descriptions have become much longer and more detailed. For example, a plant description may include how to plant it, when to fertilize it and the growing zone where it will flourish best. Not everyone wants to sit in front of a computer trying to decide which seeds and plants to order for the upcoming growing season. Sometimes it is just easier to have a catalog in hand to make notes in and refer to before making decisions regarding your garden and landscape. Catalogs serve as reference guides that you can pick up whenever and wherever you need them. No electricity or WiFi necessary. Order your catalogs a month or two before you plan to start your garden or landscaping projects. This will ensure that you receive them in time for the upcoming growing season. 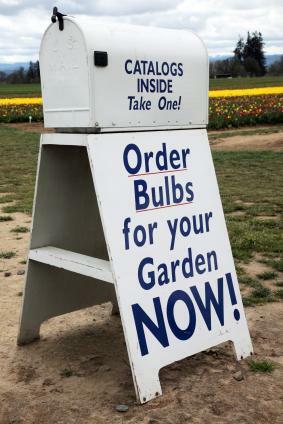 Ordering early will also ensure that you'll have the best selection of seeds, plants and supplies from your favorite mail order gardening catalog.